Learn how to change season in Photoshop. Create a spring to autumn effect in Photoshop using simple techniques like color adjustments and adding falling leaves overlays. Very easy Photoshop tutorial to change your photos look in just a few easy steps. Create a new PSD file and add you photo. For this tutorial I will use this beautiful spring forest landscape stock image. Selective Color is a Photoshop adjustment layer that you can use for post-processing your photos. Selective Color is used to create the black and white photo effect while some parts are left in color. Also you can use it for dramatic color toning, for example changing the season of a photo, like I will show you in this tutorial. You can also use the Selective Color adjustment to correct skin color in Photoshop. Click the Create new fill or adjustment layer icon at the bottom of the Layers panel, and choose Selective Color. As you can see this adjustment has a dropdown list called Colors: reds, yellows, greens, cyans, blues, magentas, whites, neutrals and blacks. We will change the settings for some of these color tones. Because every photo is unique also in terms of color tones, you have to use other color toning settings if you are not using this exact image. So play with all the Colors to obtain the best result. Autumn has beautiful orange, red and golden color tones. So to change spring season to autumn, mainly you have to modify the Greens and Yellows. Set the Reds color tones. Set the Yellows color tones. Set the Greens color tones. For the final touches click the Create new fill or adjustment layer icon at the bottom of the Layers panel, and choose Photo Filter; set the Color to #ec8a00 and Density to 40%. So here is the final result for the change season autumn effect in Photoshop tutorial. 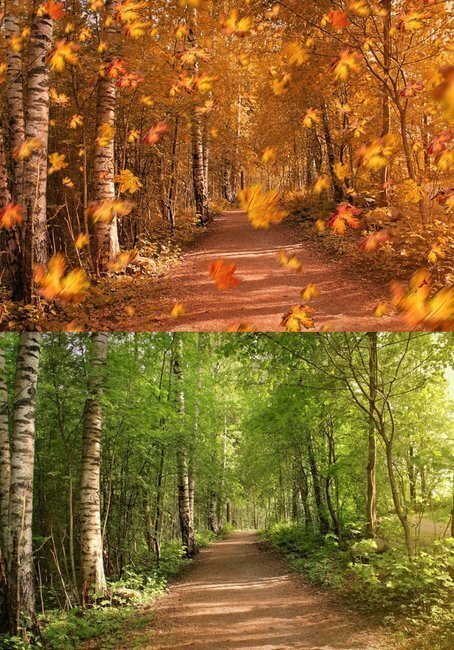 2 comment(s) for "How To Change Season Autumn Effect In Photoshop"